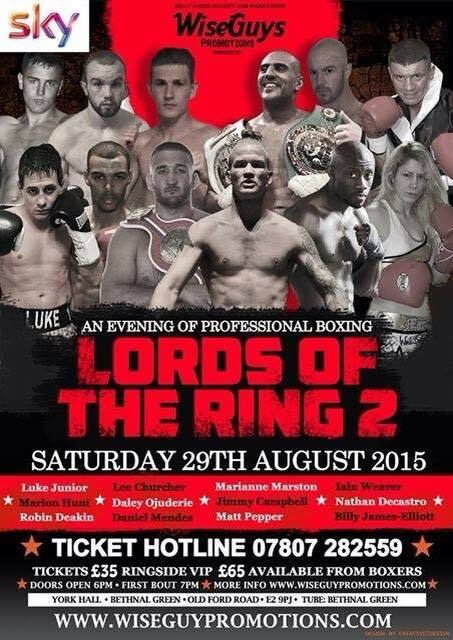 Lyons & James-Elliott Plan Huge Season Opener At York Hall 29th Aug.
London – Tuesday, 14th July 2015 – Mark Lyons and Billy James-Elliott are really pulling out all the stops in preparation for their and the Capital City’s new season opener event, LORDS OF THE RING II, at York Hall in Bethnal Green, London on Saturday 29th August. With eighteen bouts already on the card, LORDS OF THE RINGS II is looking set to be the biggest pro boxing event in the Capital this year. Heading up the massive card is reigning World Boxing Federation (WBF) Welterweight World Champion Chris Goodwin, who will be facing a yet to be announced opponent. A two division World Champion, Goodwin (19-2-1) was the first British boxer to secure a World lightweight crown in almost twenty years, when he beat Istvan Kiss for the World Boxing Foundation Lightweight title back August 2012. He then went on to secure the WBF Intercontinental crown in April 2014 before adding the WBF World Welterweight crown, with a split point win over Mikheil Avakyan at the Northgate Arena in Chester just four months later. Main support sees Woolwich, London’s British #1 ranked and reigning MBC International Super Bantamweight Champion, Marianne ‘Golden Girl’ Marston, in a non-championship bout ahead of her upcoming World title challenge. Marston, who was discovered and coached by legendary Heavyweight Champion of the World Smokin’ Joe Frazier and two time Cruiserweight Champion of the World Steve ‘USS’ Cunningham, also became the #1 pound-for-pound ranked British female, following her sensational shut out points victory over then Hungarian #1, European #3 and World #31 ranked Marianna Gulyas to secure the MBC International crown in October 2014. This win sent Marston soring up the rankings, from #58 in the World to #24 and in contention to muster a challenge for a World accolade. Heading up the support card sees London’s Jimmy Campbell (11-8-0) making his UK debut, as throughout his career Campbell had competed exclusively in America until now. During his career Campbell has been in with some of the sports biggest names, such as WBC World Champion Anthony Dirrell and WBA World Champion Virgil Hill. On August 29th Campbell faces Scunthorpe’s Jody ‘The Entertainer’ Meikle, whilst Meikle is not quite on the same level as Dirrell and Hill you can be sure that Campbell will get one of the toughest tests when he goes toe-to-toe with ‘The Entertainer’. Welsh and British Masters Champion Lee ‘Lights Out’ Churcher will also be in action, unfortunately not in the planned MBC International title fight with George Hillyard, but in a non-championship six rounder against a yet to be named opponent. Whilst on the subject of Champions – 13 time, unified World KI Rules, Full Contact Kick Boxing and Muay Thai Champion Marlon Hunt will be making his much anticipated professional Boxing debut, against Scunthorpe’s Matthew Pepper. The Lords of the Ring event also features another Globe trotting British fighter, the sensational Iain ‘The Blessed One’ Weaver (5-1-0), who will be making a rare appearance on a British event. Last time out. In Parsippany, New Jersey, was the victim of a little bit of ‘home cooking’ to the score cards - after dominating his opponent, Newark, New Jersey’s Wanzell Ellison, from start to finish, Weaver was shocked to end up on the losing side of a highly contentious split decision - so you can be sure that former Team GB star Weaver will be wanting to make a big statement and get another big win on his record. Bardsley, Lincolnshire’s unbeaten Middleweight prospect Nathan ‘Nightmare’ Decastro (4-0-0) will also be in action, as will Kensington’s unbeaten Super Middleweight prospect Daley Ojuederie (3-0-1), both against yet to be announced opponents. This event also features the long awaited return to the fray of ‘Rockin’ Robin Deakin, following a fifteen-month sabbatical from the sport. Finally, making their professional debuts on August 29th are a number of top amateurs, including Doncaster’s sensational Tom Bell (Bantamweight), Sheffield’s Luke Junior (Welterweight), Newcastle’s Jak Johnson (Super Featherweight), Hertfordshire’s Daniel Mendes (Cruiserweight), Junior Walker (Super Welterweight), Johannes Umelo (Heavyweight), Mo Holloway, Malta’s Kerstin Brown (Bantamweight) and Billy Elliott (Welterweight).